In December, I made two of these as Christmas presents (one for Mam (right), one for my sister-in-law (left)) and they were well received (but not well blogged, oops! ), but Mam decided she'd like her next one to have a longer brim so that the lazy wind couldn't get up the gap between her ear lobes and the hat! 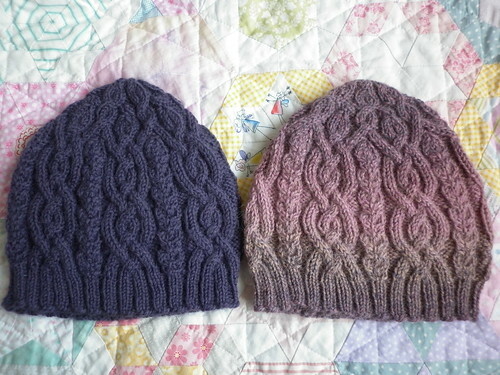 I knew I'd have plenty of yarn as I had plenty left when knitting these two hats and, although I used different yarn this time, I had about the same yardage and only needed to add an extra twenty-two rounds of rib. Hang on a moment, I'll do my best knitting pattern pose. There, that was worth waiting for, wasn't it? 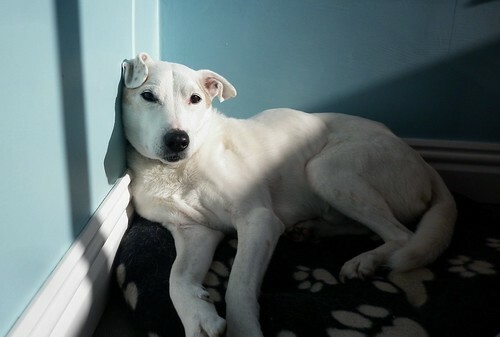 This is my 'gazing wistfully into the distance' pose - it's quite sought after, I can assure you. P.S. 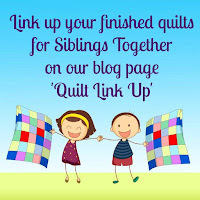 If you're making/have made a quilt for Siblings Together this year then please take a photo of the finished quilt and link it up to their linky party for 2016 before sending it to the charity's headquarters (and then put your linky number on the parcel so the charity can help Nicky and Maria keep track of which quilts have arrived). The target is for 100 quilts for this year's camps, please help if you can! 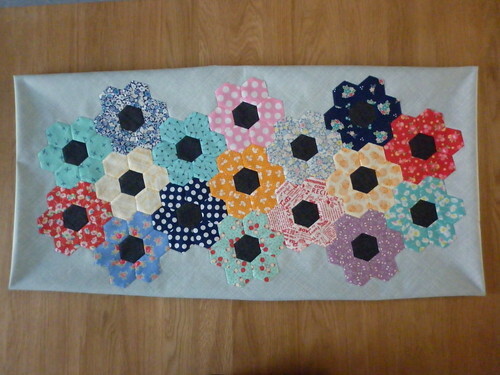 The blog is full of ideas and information about the quilt drive. 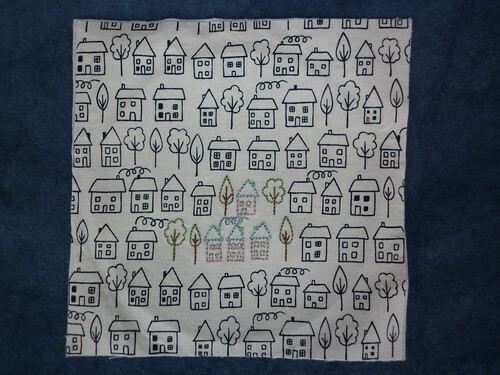 If that doesn't inspire you, then Sarah has blogged a series of scrap box block tutorials which would be perfect for a Siblings Together quilt. 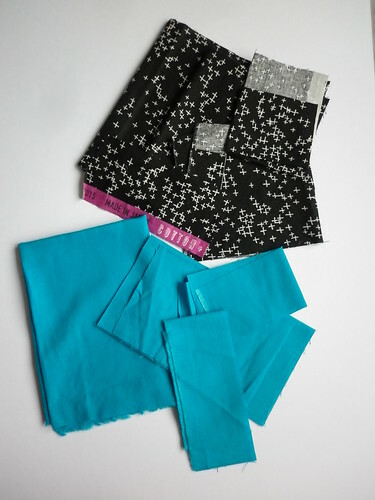 Why not organise a sewing day with a few friends (and some cake, naturally) and make a group quilt for donation? 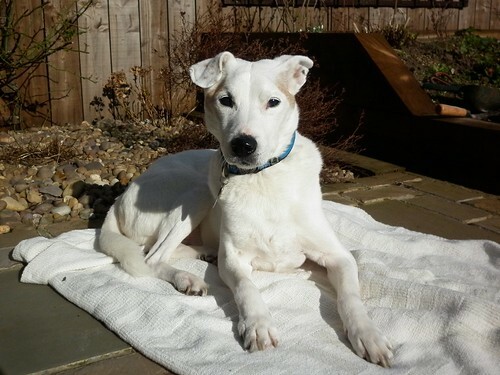 Or see if your local quilt shop/quilt group would be able to help? After last week's experiment with a mosaic of the four Summersville blocks, I'm combining that with my old approach as the mosaic couldn't be viewed any larger for examination of the embroidery in any detail. 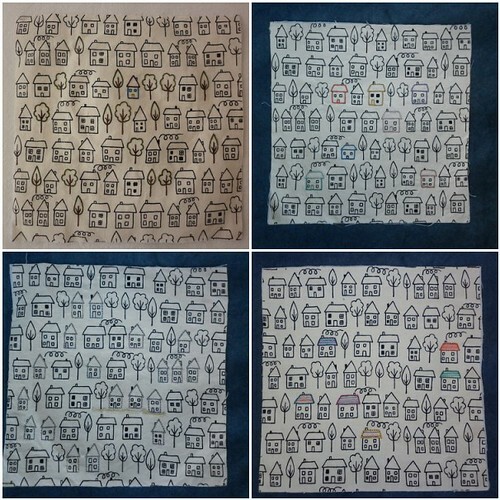 As I've said before, I started this project in 2012 as a 'sitting on the settee and watching telly with no prep required' project and slowly but surely embroidered all 49 blocks (which will be pieced into a quilt), but fell behind (mild understatement!) 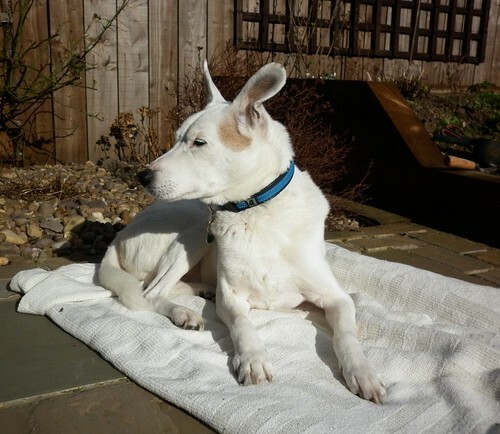 in blogging about them so I'm catching up with a weekly post. You can find the other posts in the series here: blocks 1 - 4; blocks 5 - 8; blocks 9 - 12; blocks 13 - 16; blocks 17 - 20; blocks 21- 24. 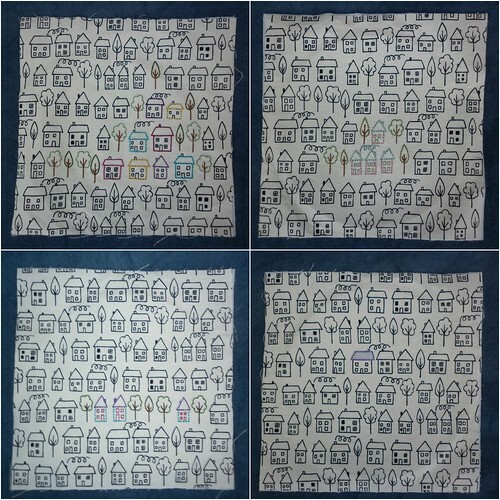 The squares currently measure 7" square, but will be trimmed to 6.5" square before they're pieced into the quilt top. 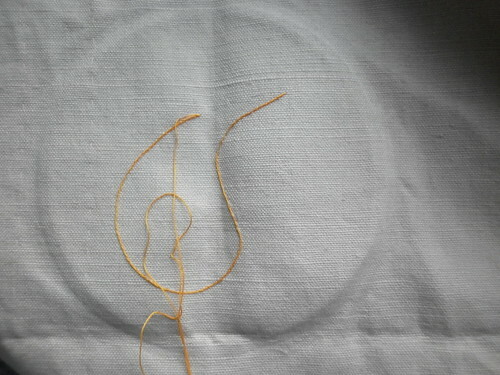 I did this so that any ragged edges/fraying could be removed, rather than being in the seam allowance. Once again, all the blocks this week have been embroidered with back stitch as, quite often, the fancier stitches don't really work on such a small scale and look out of place. 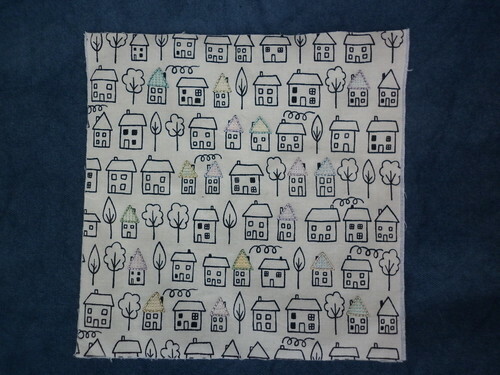 Block 25 has all the triangular roofs embroidered in ice cream colours, using two strands for the outline and one strand for the lines on the roof. I used eight colours/shades and used a different combination on each roof. 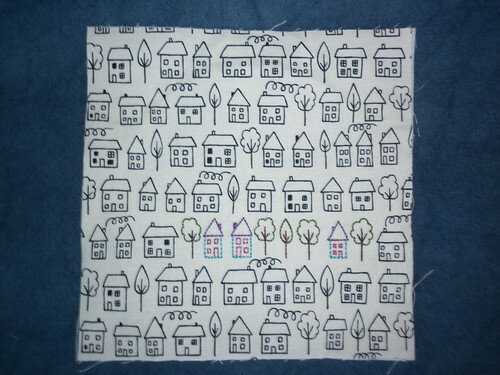 Block 26 has all of one row embroidered (the houses at either end will be in the seam allowance), using six colours for the houses, each of which has been used once in each position. 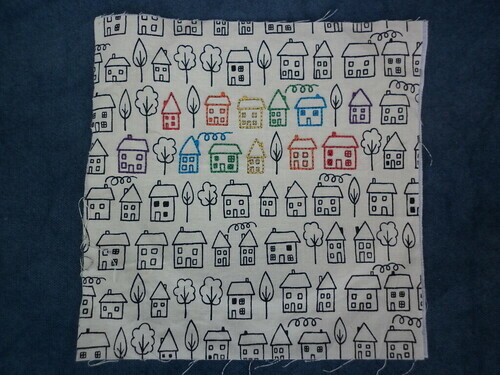 I used six colours/shades for the trees and combined one strand each of two colours so they blend together. Block 27 contains just four colours, but each house is different from the others. Block 28 has two rainbow streets - one 'forwards' rainbow and one 'backwards' rainbow. 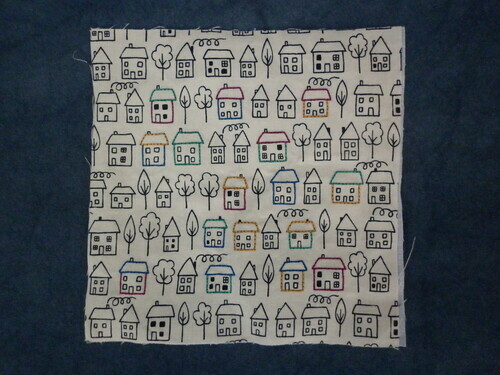 It was definitely easier to embroider these 'lots of small houses' blocks when I had a rule to apply - I think it helps to pull the block together, rather than just being a random collection of colours/houses/styles. 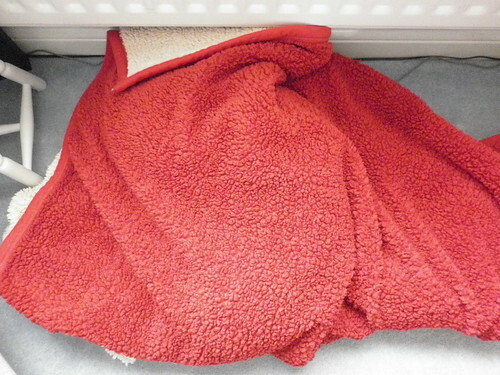 Yes, there really is a dog under there! I spy, with my little eye, something beginning with L.
In an attempt to stop Archie's hair covering the car from one end to the other, I have a big fluffy blanket (essentially two blankets back to back) covering the inside of the boot and up and over the back of the back seats (it's also handy for stopping things sliding from one side to the other when you go round a roundabout!). Every now and again (more so in the winter, when he's in and out of there with feet clagged with mud), it needs washing. 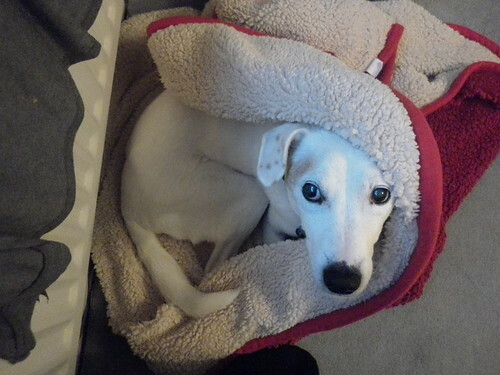 A couple of weeks ago, I brought it in and when it was finally dry enough to go back in the car I put it by the front door for the next time I was going out...and Archie claimed it as yet another bed! 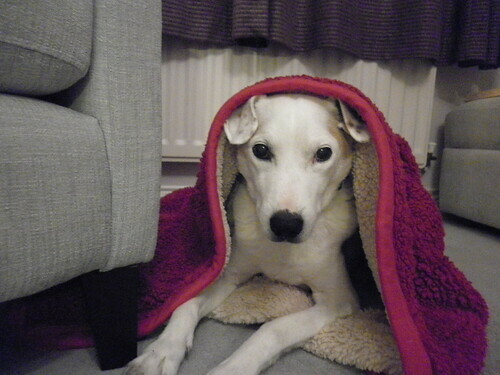 This is his third in the (small) front room alone! (#spoiltrotten) I've let him keep it for the time being as there's another one like it in the car (it was Alfie's) but he shouldn't get too comfortable..! 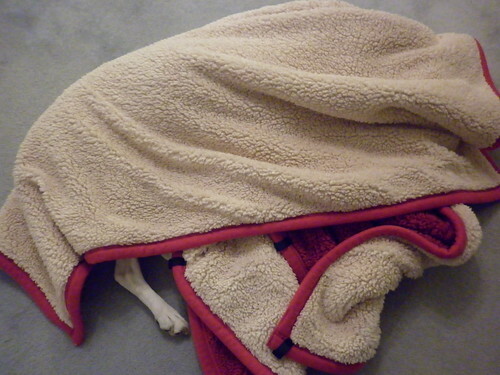 I can hear a biscuit calling my name. Did you bring it? 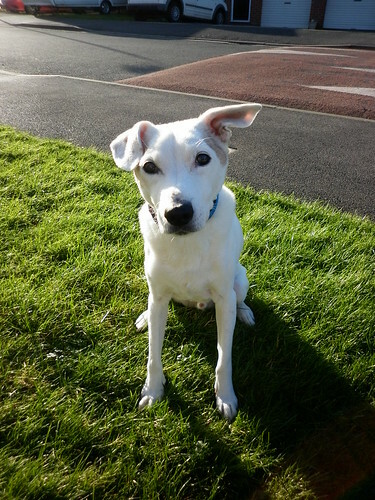 Okay, I'll be honest, I do spend an awful lot of my time watching Archie! I think we're around halfway through the first quarter of this year's FAL, so I thought I'd write a bit of a progress report on my list, which you'll find here. 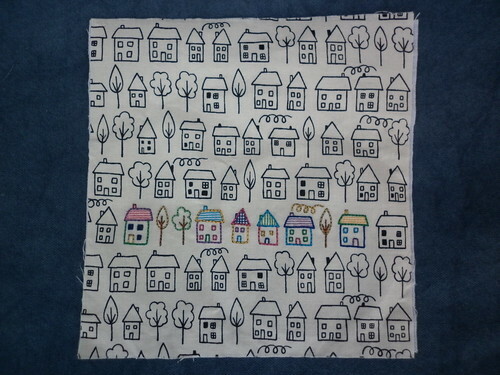 I'm just going to share the projects where I've either made progress or have finished and blogged about them, so if an item isn't here then it's either finished and awaiting its moment of glory or, more likely, hasn't been touched. I added an awful lot more lines than I thought I would. 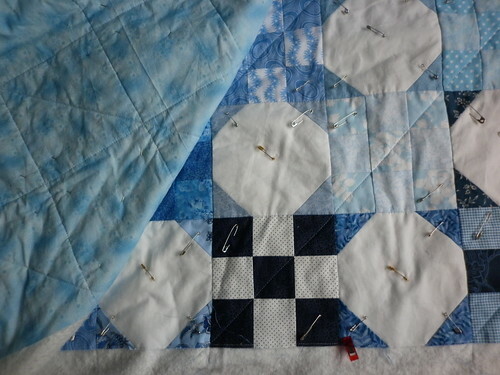 I originally planned to do the vertical and horizontal ditches between the blocks and then across each diagonal on the nine patches, but when I'd done that, it didn't look finished and the ditches of the snowballs weren't quilted. I decided to add four more lines per block and get a four patch on point effect in the centre of each nine patch, which was a lot more work (and took more hours than I care to think about! ), but was worth it. 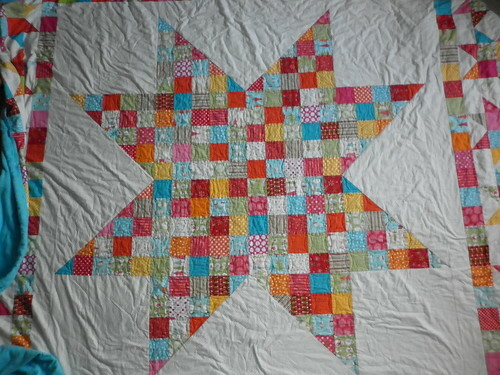 I now 'just' need to hand quilt a motif (a star?) 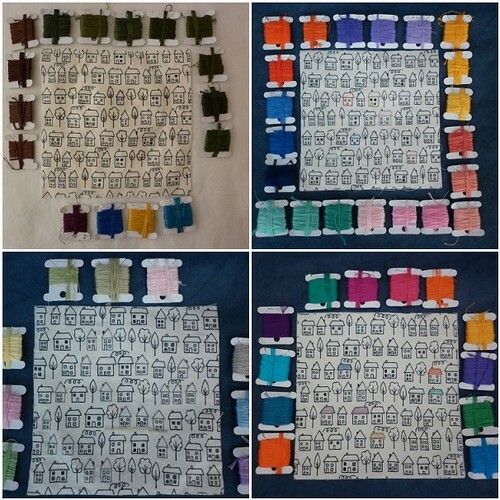 in the centre of each of the 127 snowball blocks (in perle 12 - I've chosen the shade but not yet ordered it) and the quilting will be finished. 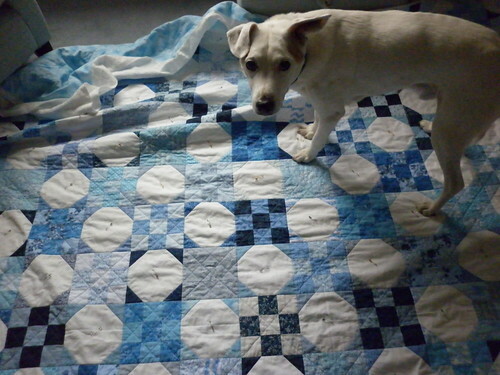 I'm not sure which will be finished first: the quilt, or me! 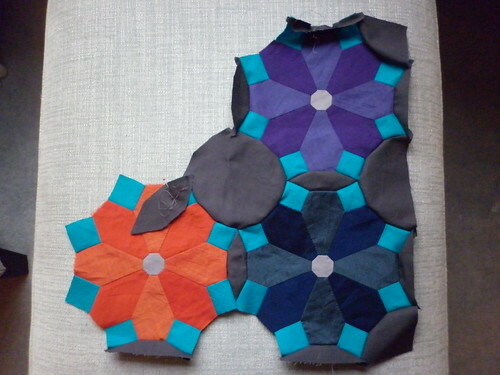 As I'm making more than one block, I was able to adapt the templates for the background pieces to remove seams and maximise the continuous stitching, so I'm doing a sort of 'piecing as you go', rather than making all the blocks and then joining them together. 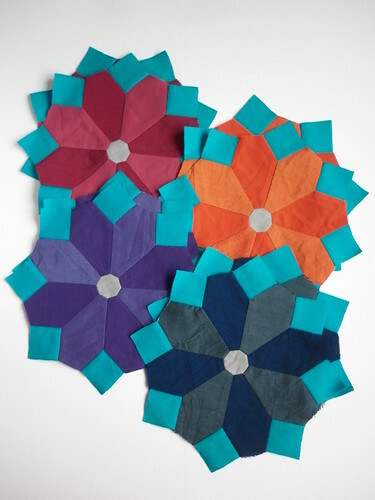 One of the advantages of hand piecing (it's not EPP!) 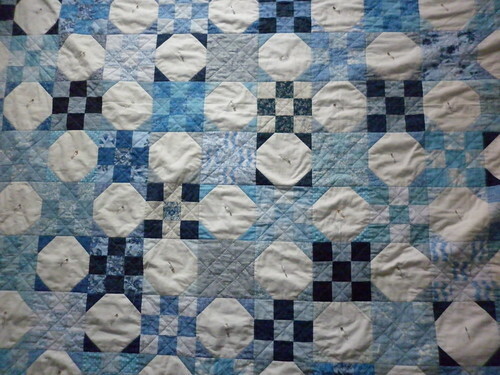 over machine piecing is that all those y/swivel seams are a joy, rather than a pain. 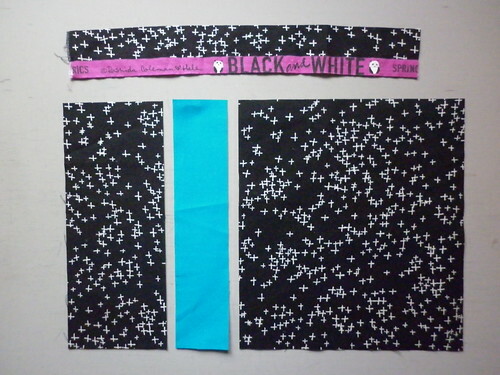 The sewing lines are a little hard to see on the dark fabric but I'm managing so far and have a chalk marker to hand, just in case I need to go over any intersections - they're the important bits and I can eyeball a straight line between them, if needs be. 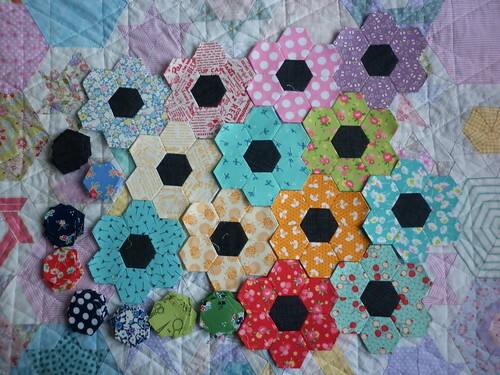 The outer pieces for my storage basket are ready for quilting, and have been for about three weeks. I'm not really doing any machine work at the moment (just too tired), but I think this will be first in the queue when I get back to it. I'm trying to make this a thrifty FAL quarter, so I'm using up scraps of wadding whenever I can, hence the occasional bit of Frankensteined wadding! And that's (finally!) the end of my we're-almost-halfway-through-the-quarter progress report! As I said, some items have been missed out because they're finished but haven't been blogged about (for no reason other than that I'm rubbish at keeping up with blogging!) or because they haven't been touched since I last took photos of them. 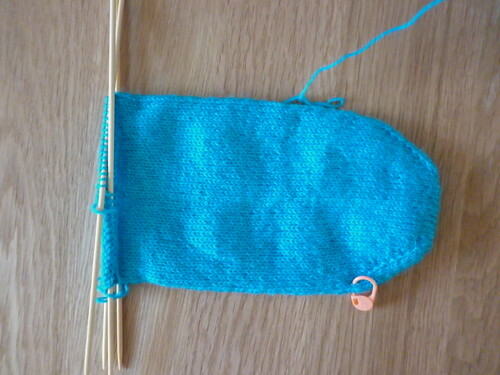 I've also started something new: knitting my first pair of socks. I decided to make life hard for myself and go toe up and, after a three attempts (which felt like playing a yarn version of Ker-Plunk!) 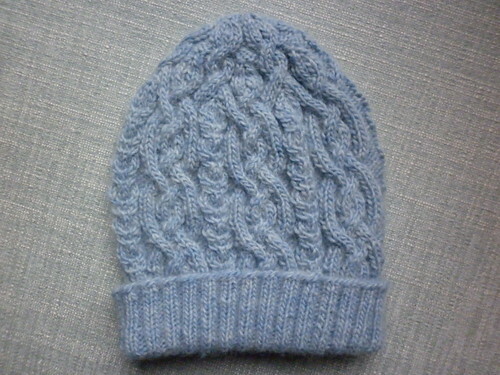 I got a nice start and have enjoyed knitting round and round. 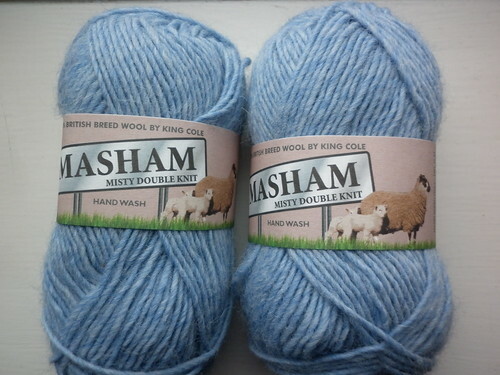 I'm allergic to wool (I'm just about managing to knit with this but my hands do get itchy after a few minutes when I have to stop for a good scratching session), so won't be able to wear these next to my skin but I'm hoping they'll make good house socks, worn over my normal socks and under my slippers. 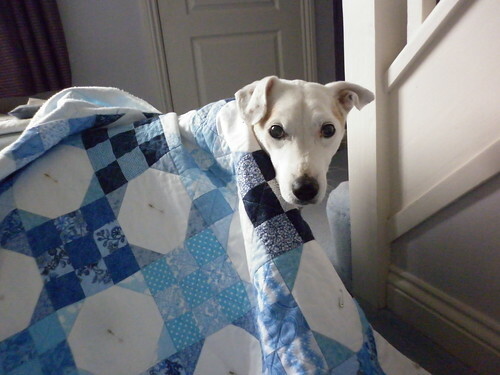 I don't care that you want to take photos of this quilt, I was here first! Thanks for popping in, I hope you're doing well with your list? I thought I'd try something different for this Summersville post and make a mosaic of this week's four blocks, rather than posting individual photos - thanks for the idea, Jude! 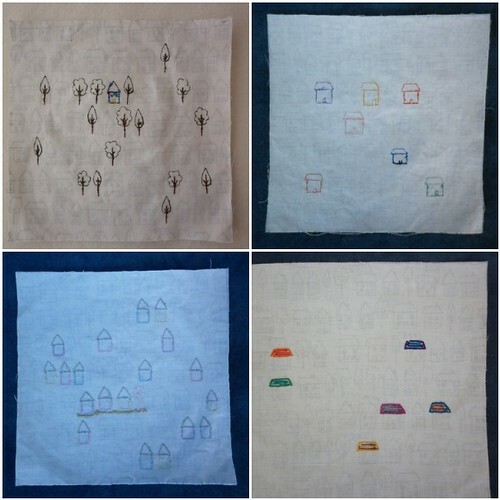 I started this project in 2012 as a 'sitting on the settee and watching telly with no prep required' project and slowly but surely embroidered all 49 blocks, but fell behind (mild understatement!) 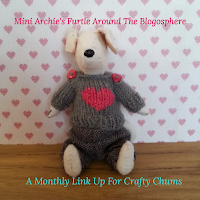 in blogging about them so I'm catching up with a weekly post. You can find the other posts in the series here: blocks 1 - 4; blocks 5 - 8; blocks 9 - 12; blocks 13 - 16; blocks 17 - 20. 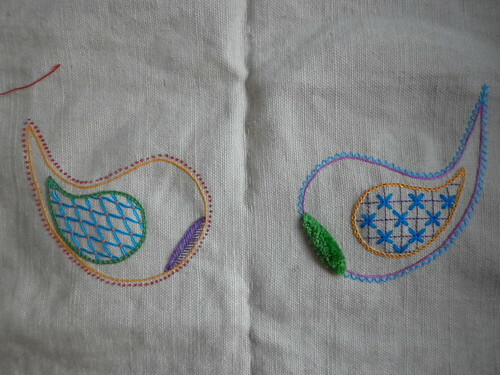 All the embroidery in blocks 21 and 22 were done with split stitch, and blocks 23 and 24 were done with back stitch - not the most interesting of stitches to do but I like the result! 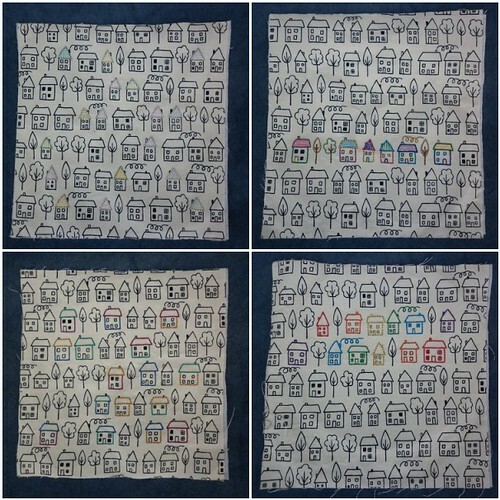 When embroidering these small house squares, I usually picked some sort of rule to follow which made choosing which things to embroider a little easier and more interesting. 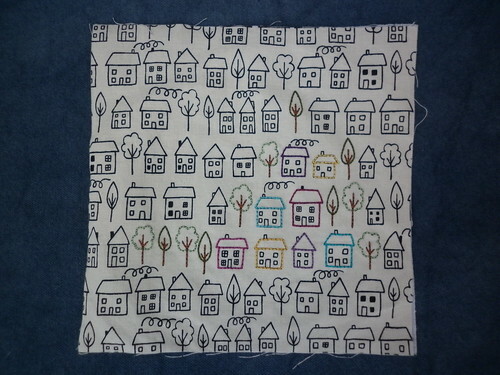 Sometimes I'd embroider all the conifer trees and nothing else, other times it would be all the houses with triangular roofs, or I'd pick six colours and use one once in each position (house/roof/chimney/windows/doors/smoke) so that all six houses were different but tied together by the colours. 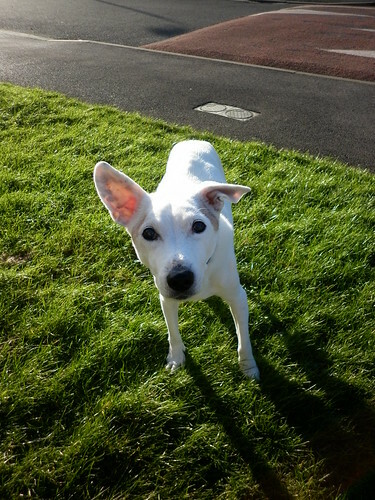 Archie wanted me to show you that he doesn't just signal with his left ear. 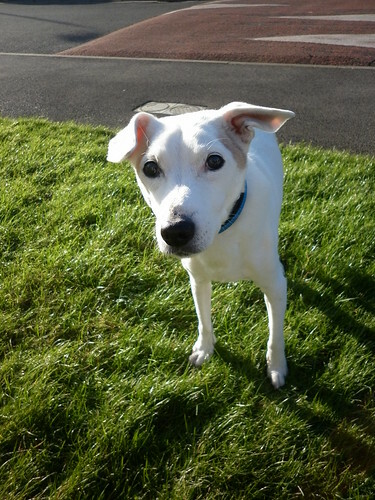 I'm not entirely sure what he's signalling in these photos, but I'm willing to bet it's about biscuits! 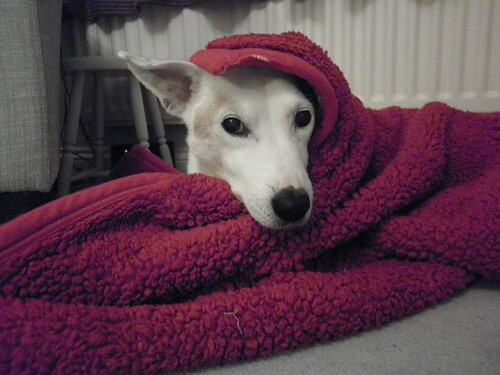 And when, exactly, do I get paid for all this modelling? P.S. After asking permission from my friend, whose workshop sample it was based on, I'm planning to write a tutorial for the machine needle book in my last post - I need to provide two tutorials for the 2016 FAL and this will be one of them. My day isn't for quite a while (the first one is in October, so don't come looking for it next week! 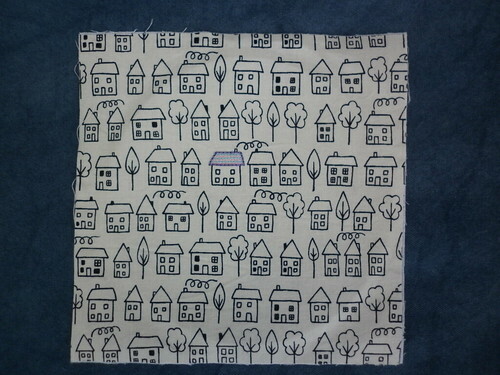 ), but I'm going to start thinking about any alterations I'd like to make to this one and may even choose the fabrics! Before I start, I want to say thank you for all your lovely comments on my last post - I really appreciate them. 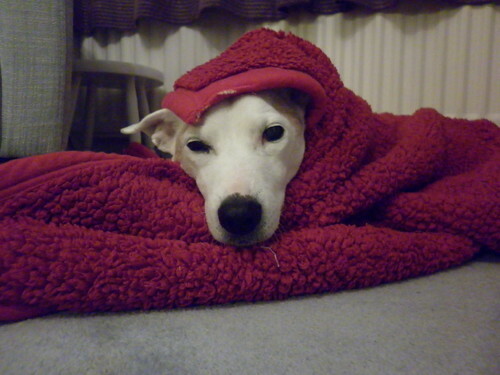 I'm sorry I haven't replied to most of them yet, I've just been too tired to do much other than sleep or sit on the settee and watch easy telly, but I will reply at some point this week. 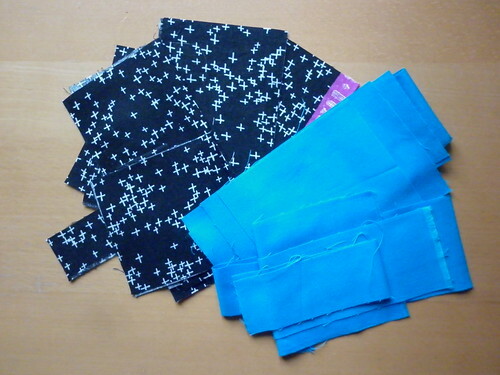 When I was writing my current FAL list, I realised I'd never got round to making a small pouch for all my sewing machine bits and bobs - machine oil, screwdrivers, extra feet, etc. 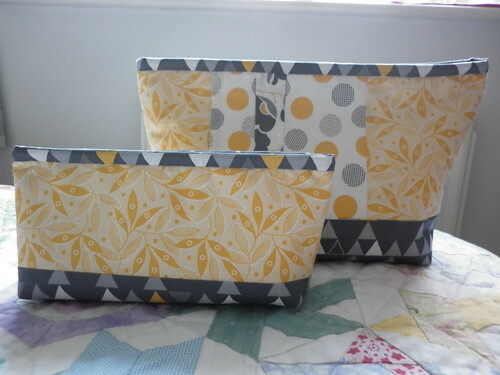 I decided to use the fabric which was leftover from making my trug and some other things which have yet to be blogged about (they're making their début later in this post!). I didn't have much of this fabric left but I knew I'd be able to get a small Lola pouch out of them with little difficulty. 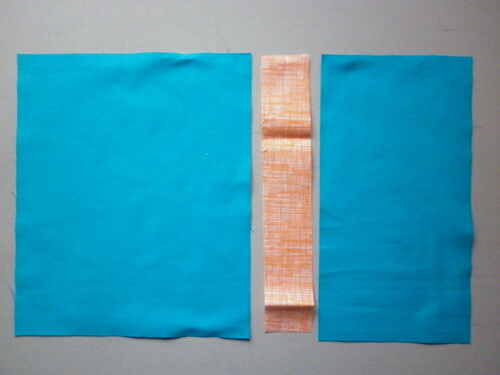 As I was using an orange zip, I decided to introduce a bit of orange to both the binding (no photo) and the lining, to tie the colours together. You may wonder why I didn't use a pink zip, to go with the background of the pandas and the answer's simple: I didn't have one! I decided to add the pandas as little 'tabs' either side of the accent strip on one side of the pouch and was going to leave them free on three sides but I didn't like how they laid on the pouch, so they got stitched down while I was quilting. 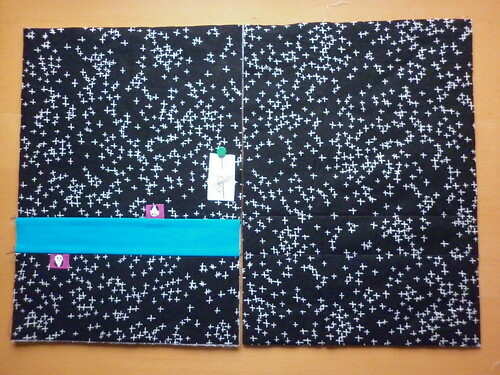 Here are the two outer pieces ready for quilting - you can just see the two lines marked with a hera marker on the unpieced side. 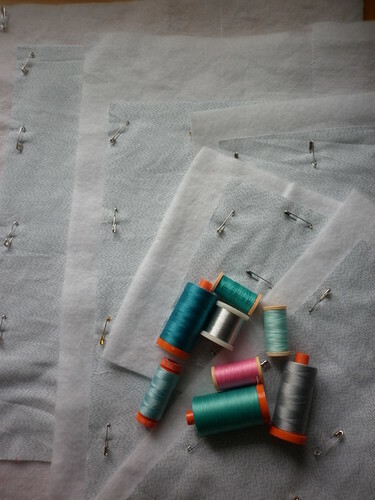 What you can't see is that I had to sew pieces of fusible wadding together as I didn't have enough of that, either! 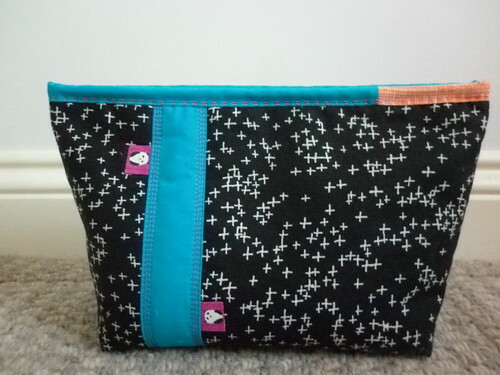 You'll also notice that I've labelled the bottom of the pieced side: if I'd accidentally turned up upside down then one of those pandas would have been on the base of the pouch, not the look I was going for! I quilted (in bright pink) down the edge of the turquoise strip (three lines each side, about 1/16" apart) and then in turquoise and bright pink on the other side; I thought it would be too plain without something and then I remembered the pouch Susan made and, er, copied! 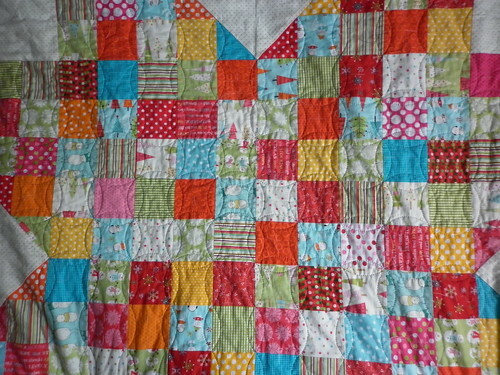 The width of the quilting is the same as the width of the contrast strip on the other side (and on the lining) but I deliberately made it so that they wouldn't line up when viewed from above, just in case I didn't get them lined up exactly! I stitched down the binding using two lines (one pink, one orange) of a fairly large running stitch in perle 12, rather than my usual (invisible) appliqué stitch and rather like the result. My aim this quarter was to blog about finishes as they happened, rather than playing catch-up at the end of the quarter. I haven't quite managed that yet as I finished this pouch in the middle of January, and I have another couple of small finishes to share, too. They'll have to wait their turn, though! Must try harder. 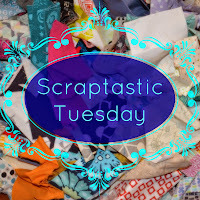 As well as linking up at the end of the quarter, I'm also linking up with Scraptastic Tuesday, as the pouch was made with fabric and wadding scraps. 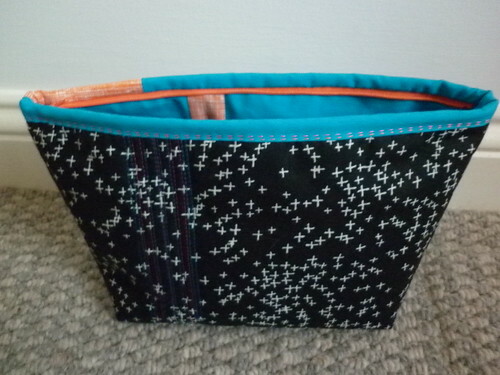 I mentioned that this pouch was made with the leftovers from some other projects, but that I'd only blogged about the trug. This is everything I've made so far, isn't it surprising how far a yard of main fabric and a metre of lining fabric will go?! I don't usually go for matchy-matchy, but I think I like how this all co-ordinates. 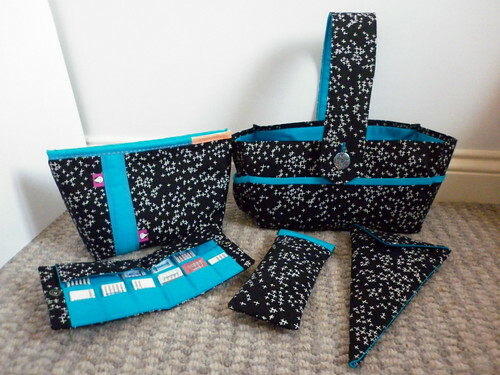 So far, I've made a trug, a large pouch, a needle book (for my machine needles), a pouch for my rotary cutter and a holder for my large fabric scissors. I still have these bits left, I wonder what I can cobble together out of this?!! 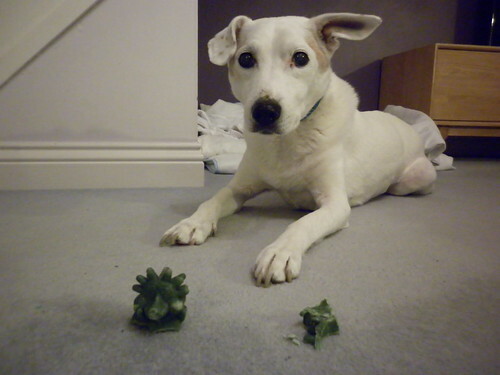 Ohhh, two pieces! What's the betting that it's really one piece cut in two to make it look like more?! 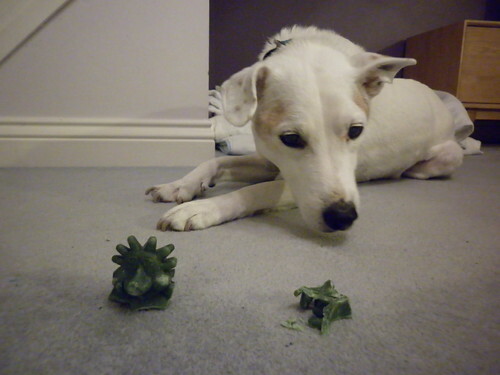 Can I eat them yet? Any chance I'm also allowed to eat the head? No, not yet.